Balance can be hard to achieve when you’re constantly on the go, but when it comes to finding middle ground between delicious flavors and quality ingredients, Wendy’s has you covered with its fresh made-in-restaurant daily salad line. From savory to sweet and simple to bold, Wendy’s offers a variety of flavor combinations that you wouldn’t expect from fast food salads. 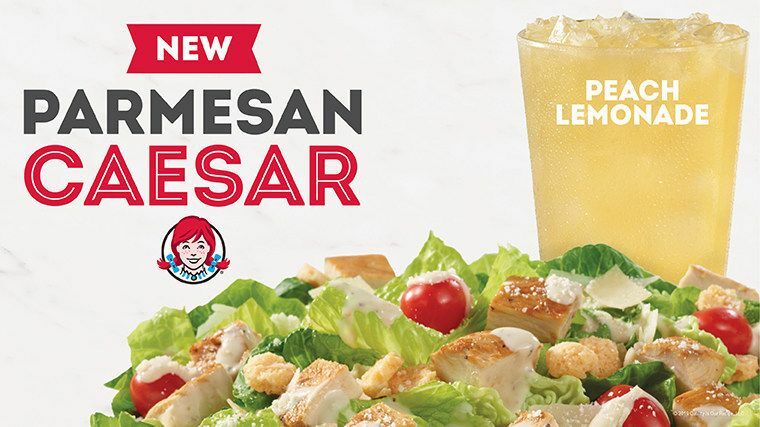 And now, Wendy’s takes salad craveability even further with the addition of the Parmesan Caesar Chicken Salad to its lineup of freshly made salads. The newest addition puts a unique twist on the familiar Caesar salad, adding an Italian three-cheese blend and crunchy parmesan crisps atop the salad for a delicious, leafy bite. Made with chopped romaine lettuce, greenhouse-grown grape tomatoes and an all-white meat grilled chicken fillet, the salad is 410 calories even at its most indulgent, full size with all dry toppings included, and is still under 500 calories when paired with one packet of creamy Caesar Dressing by Marzetti Simply Dressed. Wendy’s Parmesan Caesar Chicken Salad is new to the menu and made fresh daily, featuring chopped romaine lettuce, greenhouse-grown grape tomatoes and an all-white meat, freshly grilled chicken breast. The salad is topped with a blend of Asiago, Parmesan and Romano cheese, crunchy, parmesan crisps and paired with Caesar Dressing by Marzetti Simply Dressed. Wendy’s Southwest Avocado Chicken Salad is made fresh daily with Wendy’s signature lettuce blend, featuring pepper jack cheese, diced greenhouse-grown tomatoes, creamy avocado, Applewood smoked bacon, an all-white meat, freshly grilled chicken breast and paired with Southwest Ranch Dressing by Marzetti Simply Dressed. Wendy’s Apple Pecan Chicken Salad is an unbeatable pick that is made fresh daily with Wendy’s signature lettuce blend, crisp red and green apples, dried cranberries, roasted pecans, crumbled blue cheese, an all-white meat, freshly grilled chicken breast meat and paired with Pomegranate Vinaigrette by Marzetti Simply Dressed. Wendy’s Harvest Chicken Salad is dressed to impress. This salad is available for a limited time and is made fresh daily with Wendy’s signature lettuce blend, brown sugar walnuts, crisp green and red apples, feta cheese, Applewood smoked bacon, an all-white meat, freshly grilled chicken breast and paired with a savory Apple Cider Vinaigrette by Marzetti Simply Dressed. Wendy’s Taco Salad is a simple and yummy fan-favorite. It’s made fresh daily with Wendy’s signature lettuce blend, shredded cheddar cheese, diced greenhouse-grown tomatoes, salsa, sour cream, tortilla chips, and our famous, hearty chili. With the Taco Salad, there’s no need to wait for taco night when you can get this made-fresh salad, every day at Wendy’s. To read more about Wendy’s new Parmesan Caesar Chicken Salad, visit The Square Deal, here. * At participating Wendy’s. Pricing may vary.